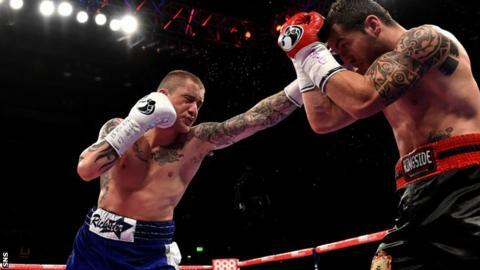 Scottish boxer Ricky Burns is on the brink of agreeing a deal to fight in Las Vegas, according to his manager Alex Morrison. The former two-weight world champion could make his United States debut at the MGM Grand in Nevada in spring against an as yet unknown opponent. "We're in advanced talks but have yet to sign the deal - we're close though," Morrison told BBC Scotland. Burns' next bout is likely to be at lightweight. And while Las Vegas looks the likely venue for that fight, Morrison stressed that other options are being considered, including Glasgow or elsewhere in Europe. The 31-year-old Burns beat Frenchman Alexandre Lepelley at light-welterweight in October in Leeds. He was defeated in a WBC lightweight eliminator by Dejan Zlaticanin in Glasgow in June 2014, having lost his WBO world title to Terence Crawford in March 2014. Morrison is, however, confident that Burns's next bout will lead to a shot at a third world title for the Bellshill fighter. "I can see him doing it again," Morrison added. "He's back in training and is hungry for more success. He has so much experience now as well, which will also count in his favour." Newspaper reports suggested Burns will fight Rances Barthelemy in Las Vegas but Morrison revealed that has not been confirmed.